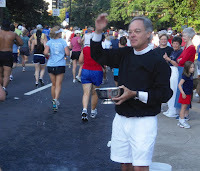 This past Sunday morning the 4th of July was my fourth attempt at the Peachtree Road Race, the worlds biggest 10k with this years just over 50,000 finishers. 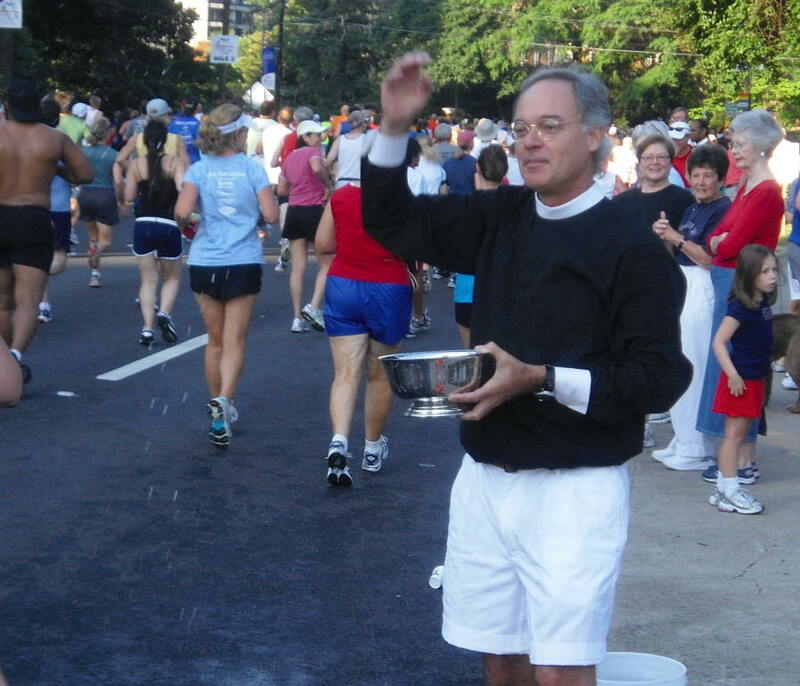 The Peachtree is always a fun event, and always brings something new each year. This year the something new was much more personal in that it was the first year my daughter Payton ran it with me. The morning started much like the other Peachtree's I have run at 4:40 Sunday morning. We had everything ready to go the night before so we could get up and out the door in 20 minutes when our neighbors (our ride) were leaving. After about a 30 minute drive we found ourselves sitting on the Marta waiting to be whisked away to Buckhead and the start of the 41st annual Peachtree. The weather was awesome, I think I heard that it was high 60's to low 70's at the start with some humidity. The best weather for the Peachtree in 10 years from what I understand. I am always surprised to see how many people we see that we know. With that many runners you would think it would be impossible to see anybody you know, but I am guessing we ran into at least 10 people we knew. We were down to about 40 minutes before the 7:30 start time so we decided to hit the square boxes one last time..... this time they were not quite as clean, or as quick. After talking to a few more friends we headed to the "A" starting corral. We had 15 minutes before race time and didn't expect to find what we did. As we neared the opening in the fence everything came to a halt. We found ourselves just standing around not moving as the opening ceremonies were starting. I was getting quite nervous now wondering what would happen if we didn't make it into the corral before the start of the race. The volunteers started yelling at everyone to push in and we finally started making some progress just as the B-52 bomber flew overhead. We were able to push our way into the middle of the road at the very back of the "A" group by about 7:25, but at least we were not still on the other side of the fence. Just a few minutes later we were off. The beauty of being in time group "A" is crossing that starting line just 1 minute after the elites, nothing like the well over an hour for the ones in the groups all the way back to "X" The first mile was difficult to run. We were so crowded that we found ourselves weaving in and out of people constantly. This would be bad running by yourself, but is just that much worse doing it while trying to stay with someone else. All the running obstacles helped attribute to a first mile of right at 8 minutes. Once getting past the first mile we started to settle into a groove. Payton was just drinking in the excitement and surroundings around us. It was after the first mile before we started to see some of the walkers (aka cheaters) that had numbers from one of the many time groups that hadn't even started yet. Yes, these are the ones that line up along the road and start to jump into the race 1,2,3,4,5, or even 6 miles down the road. It didn't take long before we started passing a lot of the interesting things that the Peachtree is known for. The Chick-Fil-A building along the way was smoking while they threw red and yellow confetti into the road along with shirts. Clever promotion of their Spicy Chicken Sandwich. One of the highlights is always the holy water from the Catholic church along the road. They have a tall pole spraying out water at the top with a sign that says "holy water" As cool as that is it doesn't come close to what comes just after it - the priest holding a bowl of water splashing it on the runners as they run by saying "bless you"
I had told Payton that I would give her the go ahead probably around 4 miles to go ahead and finish off the race. I knew she could outrun me and I didn't want to hold her back. I started to feel like I was fading a bit about 3.5 miles and so I gave her the go sign and told her I would see her at the end. She slowly went off into the distance and I was then running alone with a few thousand of my closest friends. I never have an issue with the Piedmont hill which everyone always talks about, but my mental block comes after crossing the I85 overpass. Something about that spot has gotten me both last year and this year. I can't just slow down, I end up walking a few steps. I was on track (although very close) to possibly getting down into the 47's and setting a new 10k PR, but once I stopped and walked these few steps I knew I had blown the chance. I got going shortly afterwards but took a couple more of these "few steps" breaks before the race was finished. I am guessing that these breaks all together added up to about 30 seconds, but I am still irritated at myself for giving in and taking that first step. After the race I got my coveted shirt, some water, some food and headed over to find Payton. I was excited to see how she did. She said she finished and quickly turned around to see what the time was on the clock because she knew people would be asking. After some quick math I came close with 46:44, but her official chip time was 46:37! An awesome job! In those last 2.7 miles she cut almost 2 minutes off of my time! :) Have I mentioned that this was her first 10k? I won't bore you with the rest of the details of the stinky Marta ride home, or the stinky car ride home, I will let you just imagine a train full of runners after a 10k, or a small compact car with 4 post 10k runners crammed in it. After a good lunch and some cleaning I took a long nap. I then went out for an easy 3 mile run with my other daughter Ashlee who will be running it with us next year! She wasn't quite ready to run it when we needed to sign up, however she could have done it as she has put in a few 6 milers in the past months. Great job! Perfect weather! It made me appreciate the humid runs because I felt so fast with the cooler weather!!! Excellent race, congrats! That's a race I've longed to do but always fear the heat/humidity. Aw, congratulations on another good race, Tim! And that's awesome that Payton did so well, too! totally awesome! i am so glad you got to share this experience with your daughter. i can only imagine how excited she was!! great job!! Woot! Great job to Payton!!! You did great too, so close to a PR! Painfully close! Too funny! Fun read, Tim. Being able to share the race with our kids is the best part. Last year I caught one of tbose Chick-Fil-A shirts and had to carry it with me the rest of the race & it was too small for me anyway. This year I didn't raise my hand for one. Thanks for a great recap. @Jill - you missed the best weather to run it in this past Sunday - the best for 10 years. Don't worry about it and get out there and run it.... you will be glad you did! @Jack - You are right, this was my favorite one so far because I was able to do it with Payton. I got one of the Chick-fil-a shirts two years ago when I walked due to a broken collar bone and still got tired of carrying it (mine was too big for me). This year we made sure to move to the right when coming up on it. Great race recap! How awesome that Payton joined the fun. Next year will be even better.